June | 2011 | Teachers Act Up! Welcome to MELISA CAHNMANN-TAYLOR‘s website which aims to be a resource for all teachers seeking to incorporate the arts and social change into their classrooms and lives. The site showcases her recent arts-based work in education including recent videos of teachers using theatre games to enhance multilingualism, boost creativity, and create multicultural learning communities for reflective and revolutionary practice. This website builds from Dr. Cahnmann-Taylor’s co-authored book, Teachers Act Up! 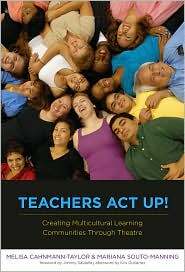 Creating Multicultural Learning Communities through Theatre (Teachers College Press, 2010).